Orders grounding the Air Force’s F-22 Raptor stealth fighter spread from Virginia to Alaska this weekend, briefly sidelining up to half of the roughly 170 Raptors. It’s becoming clearer by the day that the problems vexing America’s premier stealth fighter are neither minor nor temporary. The current lock-down echoes a fleet-wide grounding between May and September that was prompted by a suspected flaw in the $150-million-a-copy jet’s onb0ard oxygen-generating system. Pilots had reported mid-flight blackouts and disorientation, possibly resulting from too much nitrogen in their air mix. Despite an extensive investigation, the Air Force never found the flaw in the oxygen generator. The brass ordered an additional filter installed in the oxygen system, then sent the Raptors back into the air on Sept. 19. “We’re managing the risks with our aircrews, and we’re continuing to study the F-22’s oxygen systems and collect data to improve its performance,” said Gen. Norton Schwartz, the Air Force chief of staff. 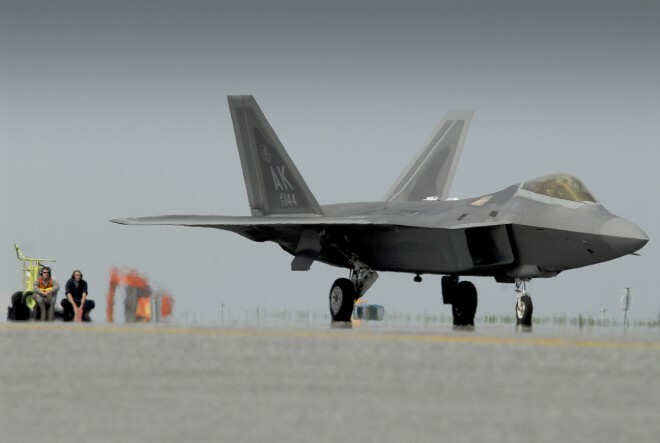 But the Air Force’s increasingly out-of-practice F-22 pilots enjoyed just a few weeks of refresher training before an incident in the skies over Virginia prompted the latest stand-down. A pilot from the Langley-based 1st Fighter Wing, America’s most elite air-combat formation, reported oxygen loss during a flight last week. The local commander decided to ground the wing’s roughly 40 F-22s. On Thursday, officers from the 3rd Wing at Elmendorf, which possesses a similar number of Raptors, followed suit. All F-22s, even those under no-fly orders, can still be deployed for what Sholtis called “national-security missions” — most likely meaning full-scale war. But it’s becoming harder by the day to maintain the Raptor pilots’ fighting skills. With investigators still flummoxed and pilots still blacking out, it’s a safe bet that the stealth fighters — and their pilots — will be spending a lot of time on the ground for the foreseeable future.